This referral includes 2 sheets to use in your special education classroom. The first page is an list of behavior interventions and strategies for general education to use in their classroom. 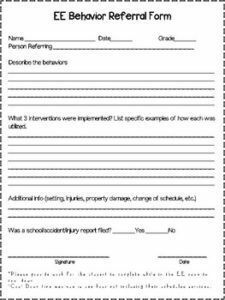 The second is a referral form for general education teachers to use when they need to send a student to the special education room to refocus or cool down. I hope you find these sheets useful in your classroom!